Over the last 7 days, the Greater New York Red Cross provided emergency assistance to 203 adults and 88 children following 91 local disasters. Here are some highlights from last week and a preview of some upcoming events. Over the weekend, the Red Cross teamed up with the US Merchant Marine Academy to train 200 freshman midshipmen to provide support at Red Cross shelters in our region. On Saturday, Long Island Red Cross volunteers supported Hempstead residents returning home for the first time since Thursday's massive fire by distributing fire clean-up kits. After handing out those clean-up supplies and heading back to our Mineola HQ, volunteer Bruce Vesloski witnessed a car get T-boned by another vehicle. Bruce proceeded to provide comfort to the woman trapped in her vehicle while firefighters and emergency responders worked to free her. Way to go Bruce! That massive 5-Alarm fire in Hempstead, N.Y. occurred on Thursday afternoon and it tore through an apartment building and forced hundreds to evacuate their homes in the bitter cold. 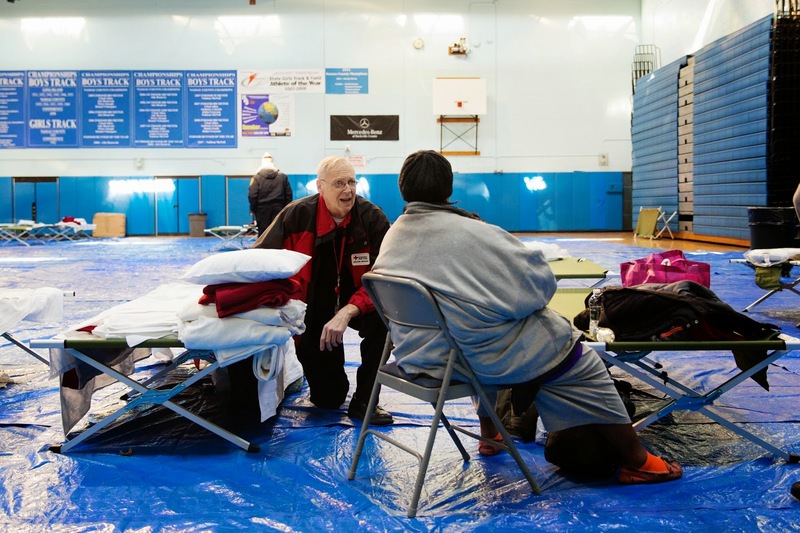 Red Cross teams assisted affected residents by setting up a relief center at Hempstead High School where safe shelter, food, health assistance and emotional support were provided. Dozens of residents stayed overnight over the course of two nights. Wednesday night, volunteers from the Metro New York North Red Cross were at the scene of a building fire in downtown Yonkers. Working in close partnership with Yonkers city agencies, the Red Cross provided support to first responders and temporary housing and emergency financial assistance to four families. Earlier in the week, to help kickoff the annual Westminster Dog Show, we shared a few tips to help your pets stay safe and warm this winter, along with photos of some really cute dogs. Feb. 25 & 27: Red Cross blood drive; 1 to 7pm; 520 West 49th Street, Manhattan. Click here to register. Feb. 25: Thank you event for LI Red Cross partner Rallye Motors. Feb. 28: Disaster mental-health volunteers from across the region will gather at our regional HQ in Manhattan for a seminar on mass casualty incidents. Feb. 28 – Mar. 1: As part of the Red Cross Home Fire Preparedness Campaign, volunteers will be out in the Bronx, Staten Island and Long Beach, N.Y. installing free smoke detectors and talking to residents about fire safety. Mar. 1: Beginning of Red Cross Month! Mar. 10: The Brooklyn Nets will host an American Red Cross Awareness Night (versus the New Orleans Pelicans). For every discounted ticket sold at this web site, the Brooklyn Nets will donate a portion of the proceeds to the Red Cross. If 200 tickets are sold, the Red Cross will be honored with a special halftime recognition.